We also finally got him the sash for all his other badges, and his patrol badge (the Native American in red and white). His patrol name is "Insane Indians" which bothers Simon, but it is what the patrol leader chose, so that's that. As you can see he also has 7 badges on his sash. Yay! He hopes to get 6 more badges at camp this summer, and he's currently working on orienteering and hiking. Cool, huh? Next Monday I'll try to get a pic of him in his full uniform again. Boy, he's handsome! Gee, do I remember those days. 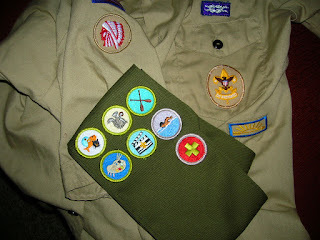 My guys were the only ones in the troop who, at times, had badges that were sewn on in odd ways. I'm not a seamstress. Enjoy Simon, he'll be grown before you know it. I'm proud of him also.